In our DiA small group sessions, we often talk about some of the challenges leading people can present you. Leading others is easy when you have a team of highly capable, highly motivated and resilient individuals who are 100% aligned to the vision, have clarity about their role in making things happen, work collaboratively with others and are fully accountable for achieving results. Sounds terrific, doesn’t it! Does it describe your context right now? I dare say not many of us are blessed with a situation like this for all of our leadership careers. Typically we have at least one person that demands our leadership energy – and not usually for the ‘right reason’. A DiA participant shared a useful model with me that helped present one view for the choices you can make when finding your leadership energy zapped by another. It is commonly referred to as the ‘Pioneers and Outlaws model’. the pioneers / explorers – the motivated, capable, resilient, self reliant achievers, the driven + curious innovators. the early settlers – people who follow behind the pioneers, our competent performers, who adapt well to change, our accountable achievers who ‘get on with it’. 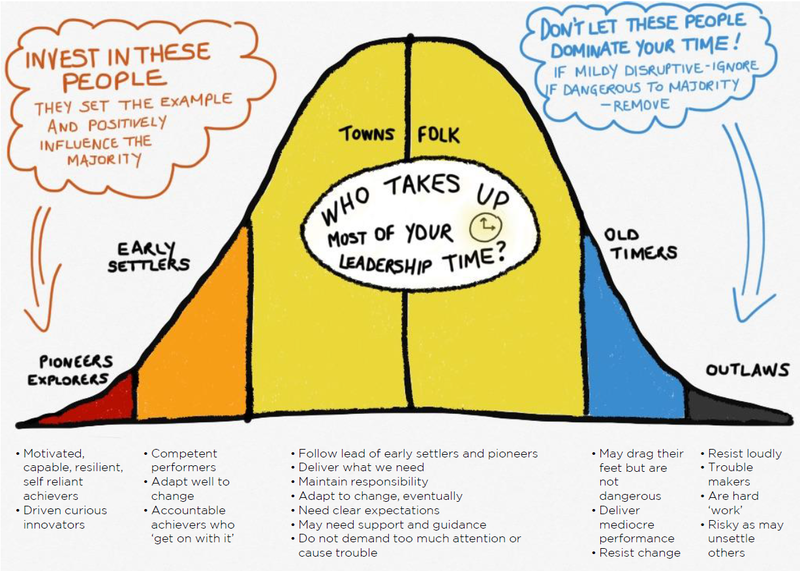 the townsfolk – the majority of our team, who follow lead of early settlers and pioneers, who deliver what we need, maintain responsibility and adapt to change eventually. They need clear expectations, may need support and guidance, but do not demand too much attention or cause trouble. the old timers – the ones who resist change, may drag their feet but are not dangerous. They deliver ‘just’ what we need – mediocre performance. Sometimes as a leader, we find the squeaky wheel is the one that gets the grease. But is this the best place for our energy and time? don’t let the outlaws (and even sometimes the old timers) dominate your time! If they are mildly disruptive, ignore them. Deal with them only if they are ‘dangerous’ to the rest of the team. instead, invest that time in the pioneers and the early settlers. They set the example and positively influence the majority. Time and energy invested here can help to have a positive impact not only on the achievers, but on the broader culture too! I have been unable to find a source for this model, so have created the drawing myself. Thanks to David Harris (Operations Officer – CFA) who shared a model shared with him by Stewart Kreltszheim (Operations Manager – CFA) – who shared his memory of a model described by Nathan Burke (ex St Kilda) on a training course he attended in the early 2000’s!